Both Phone sports a metal frame and 3D glass galaxy A7 (2017) Design looks similar to Galaxy S series. Galaxy A7 2017 series feature a 5.7-inch (1920×1080 pixels) Full HD Super AMOLED display with Always ON Display compared to 5.5-inch FHD (1920×1080) Super AMOLED display on Galaxy A7 (2016) Both are powered by an Octa-Core processor with 3GB of RAM. Galaxy A7(2016) has a 16GB internal storage whereas Galaxy A7 (2017) sports a 32GB of internal storage. 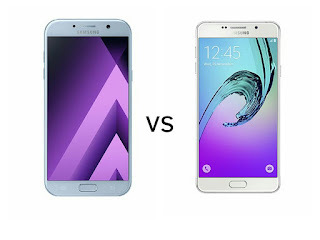 On camera Galaxy A7 (2017) comes with a 16 Megapixel front and rear camera compared to Galaxy A7 (2016) has a 13MP rear and 5MP front facing camera. Galaxy A7 (2017) is packed with a 3600mAh battery compared to 3300mAh on Galaxy A7 (2017). Galaxy A 2017 smartphone offers IP68 water and dust resistance, allowing it to withstand the elements, including rain, sweat, sand and dust, making the device suitable for nearly any activity or situation.